Who’d of thought he’d be such a huge loss? Since I can’t find my copy of Four Views of the Book of Revelation in order to cover the 3rd view, I’ll consider sports. I’ve been meaning to work on this post for a few weeks, but haven’t had the free time and mental space. You may think I still don’t have the mental space for it. I want to consider a similarity between the Boston Red Sox and the Boston Celtics: injuries. The point being how injuries have derailed the last few seasons for both teams. Sports teams are really fragile things. There are times when teams can survive and even thrive during a rash of injuries. The Green Bay Packers did this to win the Superbowl in 2011. Those instances are rare. Most often, the depth of a team is tried and then depleted. Hopes vanish and dreams are squashed. The Celtics won the NBA title in 2008 and seemed poised to win a few more before the New Big Three fell apart. But injuries have continually derailed that hope, and Celtics fans are disappointed. In 2009 it was Kevin Garnett’s various injuries that left them depleted. Without him they nearly beat the Magic to advance in the playoffs, but it was not to be. A healthy KG, and the Celtics go to the Finals. The next year, KG was not healthy, but was playing. They made it to the Finals against the Lakers. Then, in Game 6, Perkins blew out his knee. His presence in that abysmal Game 7, the film of which should be burned for the sake of both teams, may have made a significant difference. We won’t know. But the Lakers did triumph. Then there was last year. KG was healthy, but there was the big trade that sent Perkins packing for 2 players. He was still not right, but the emotional toll on the team seemed too big. Both O’Neals had injury problems. Until the playoffs. They put it together after their late season skid. They made it to the conference finals against the arrogant Miami Heat who hope to win 7-8 titles in their imaginations (Father, may it not even be one- oppose the proud!). In a painful moment caught on film, D-Wade pulled down Rondo while falling. Really cheap play, and their series this season against the Pacers shows they are inclined toward the cheap plays. 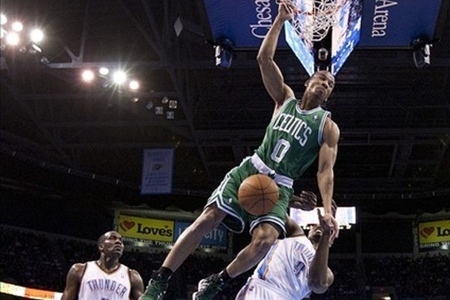 Rondo’s dislocated elbow sunk the Celtics. He valiantly tried to play, but with only one functioning arm, his defense was a liability. That moment dashed the Celtics hopes. The Red Sox are in a similar state of affairs. They won the World Series in 2007. Despite injuries to Josh Beckett and Mike Lowell, the Red Sox made it all the way to the AL Championship against new rivals the Rays in their first ever play off appearance. Beckett pitched, but was a shell of himself. So close, but they fell in 7 to the Rays who would get handled easily in the World Series. Oh, for a healthy Beckett or Lowell. Just one would have tipped the scales enough. Just one. 2009 was just a mess for the Red Sox. It is a blur of injuries in the last few months that sunk a promising season. I have erased it from my memory. 2010 looked so promising. In the opening weeks they lost Ellsbury and Mike Cameron for essentially the season. Beltre not only provided power to the line up but single-handedly destroyed the outfield. The only remaining starting outfielder was J.D. Drew, and we all know he’s good for a few trips to the DL. Daniel Nava and Darnell McDonald came out of nowhere to provide some spark. But then the injuries began to mount up- Youkilis, Pedroia, Martinez. So many injuries to key players- there were done. D-O-N-E. I know, I’ve been derelict in my duty. I have more important matters to attend to. But I have some spare time, so it is time to look at the second approach in Four Views on the Book of Revelation: idealism. Often this is called the Spiritual view. I’m not wild about that term since it wrongly implies spiritualization, which is a problematic way of interpreting the Scriptures. Spiritualization treats the Scriptures as if they have special meaning that isn’t on the surface of the text. Typology, for instance, recognizes the historical events of the text, but says they also point to Christ and His work. Spiritualization does not recognize the historical events. I hope that makes sense. This view is NOT spiritualization. The idealist view does a few things. First, it recognizes that The Revelation is filled with symbolism. To interpret it literally means to recognize the symbolism. Second, idealism recognizes progressive parallelism throughout the text in keeping with apocalyptic writings like we find in the prophets. The Revelation contains a series of visions about the same events from different angles, with increasing intensity. Therefore, the Book is not to be read chronologically (again, try to do that with the prophets and you’ll become very confused). Often, these different visions are indicated by “I saw heaven opened” (this is the title of Michael Wilcock’s commentary.) The third main feature of the position is that these visions represent patterns throughout history that culminate in the consummation at Christ’s return. Most idealists hold to the amillennial position. This means that chapter 20 is a symbol representing the present age instead of chronologically following this age. This means that the battle at the end of chapter 20 is the same battle as we find in chapter 19. Christ returns at this end of this age to defeat His enemies, deliver His saints and restore creation. The amillennialist says that we are currently in the millennium. It is technically a post-millennial position. As an idealist with some preterist leanings, I was not impressed with Sam Hamstra Jr.’s presentation. Commentaries that hold to this view, that are quite good, include Hendriksen’s More than Conquerors, Poythress’ The Returning King, Dennis Johson’s The Triumph of the Lamb and Derek Thomas’ Let’s Study Revelation. One thing that I found troublesome in Hamstra’s presentation, as opposed to the others, is that Revelation essentially becomes a book without a historical context (“They may have no historic connection with any particular event”). The book was intended to provide comfort to the original audience, and to us when we suffer in similar ways. We are not the original audience, but it applies to us too. The letters to the seven churches are to the whole church, at that time. Here he recognizes the historical context. John is addressing their needs and trials. They do not represent 7 successive periods in the life of the church, as some people teach. The big picture is the prominence of the throne of God. What plays out is a result of God’s plan and purposes for the world. History is under the direction of God, and the preservation of the saints and destruction of his enemies are a part of that. But we see rivals to God arising. The dragon, Beast and False Prophet comprise a counterfeit trinity and the Harlot is a counterfeit church (Poythress in particular is very helpful here). While they may prevail in the short-term, Jesus wins long-term, and His people preserve through the blood of the Lamb. He is a Lamb to us, and a Lion to His enemies. The Revelation is a revelation from Christ about Christ. In the present, we see the power of the Beast in persecution, the False Prophet in deception (cults), and the Harlot in seduction. All three work in the power of the dragon, who is Satan as John tells us in Revelation 12. At any particular point in time, a church will experience one or two of those strategies. Here in America we are subject to seduction (consumerism) and deception (cults and secular humanism). At some point, we may experience persecution like many Christians around the world currently do. This frees us from thinking the book is for our generation, though it applies to our generation. It frees us from thinking the books it for some far off generation, because it applies to our generation. This frees us from all the erroneous speculation that we see in dispensational teaching (Walvoord, Lindsey, LeHaye etc.). The point is not to generate fear- but for us to trust (rely upon) Christ who will prevail. We need to be vigilant about our lives, not obsessing about the European Union and bar codes. The idealist position functions more as a theology of history than a chronology for the end of the world. As Hamstra notes, it is idea rather than event oriented. As a result, it helps us to apply the Revelation to any generation awaiting the return of Christ. I suspect it goes without saying that most of us have not been loved well by those in our lives. Our parents often did their best, but they had the same problem we have. So do our friends. When you have not been loved well, you don’t love well. On the surface, it appears to be a vicious cycle from which there is no escape. But it is not a closed system. If it was, this would be true. But there is someone outside the system that can enter it, love us well and enable us to love others well. This is the premise of Loving Well (even if you haven’t been) by William Smith. The idea is that we only love well if we’ve been loved well. This is a biblical concept, as expressed in 1 John 4. In the gospel, we see that God brings us into His community of love and love us well. As we are loved, we learn to love. Smith develops this in a very practical way. The 15 chapters of the book cover 15 aspects of love. He shows us how God has loved us in this way, and provides some practical ways we can express this love to others. As a result, this is a very gospel-centered book instead of a moralistic book. It is about what Christ has done, not a bunch of steps or principles to follow. Super Hero movies are all the rage these days. I enjoy many of them. They are often about things our culture struggles with: technology, government etc. They often portray a world in which there is good and evil, and in which good ultimately prevails. Many of the Marvel heroes share in our foibles and weaknesses. They are not perfect. In a sense they give us a measure of hope that people can solve the crises before us. But, I think, there is a potentially dark side to this “hero worship.” Or should I call it “hero longing”? The problem is not the heroes themselves, but the limitations of the heroes which, in part, creates their appeal to us. Heroes deal with external evil. They rescue people from the tyranny and destruction of an evil being. They recognize that evil is “out there”. They are capable of dealing with evil out there. And the evil “out there” needs to be dealt with. We do need someone to rescue us from evil people and evil structures. This is one reason why so many rely on government- to rescue them from evil out there. Governments should be just, and punish evil doers (Romans 13). But it is what neither a hero nor a government can do that is just as important. Dealing with the evil within. I don’t actually go to the movies very often. Way too expensive to happen as often as when I was younger. So, I wait for the movies that beg for the big screen: action. The Avengers is one of those movies whose siren call I could not resist. And I was not disappointed. I really wasn’t into comic books as a kid. Some of my friends were. The medium was just lost on me. Seemed too much like the children’s books. I don’t know. But I’ve always enjoyed the movies starting with the Superman series when I was a teenager. Okay, just the first two. Did they make any others? This year will be comic book hero heaven as they wrap up the Batman series, re-boot the Spider-Man series with a darker take (why did they do this again?) and introduce The Avengers series. They have been building toward this with the 2 Iron Man movies and then both Thor and Captain America last year. Those two movies introduce some key elements to the plot of The Avengers. I only saw Captain America, but I was fully able to follow along with what was happening in The Avengers. Some of the other characters appeared in some of the Iron Man movies. So, you walk into the movie having back stories on some of the Avengers. This is the third movie for Hulk, and the third actor playing him. The second was essentially a reboot of the first (and much better). Edward Norton did a great job as Hulk, but apparently fans just miss Bill and Lou because Hulk, despite his incredible strength and jumping ability can’t get off the ground as a series of movies. Enter Mark Ruffalo with his take on Hulk (this is turning into the first Batman movie series: both Kilmer and Keaton were very good, and Clooney utterly horrendous). It is almost like the other two movies didn’t exist. Mark is sort of the hippie Hulk. The laid-back genius who is supposedly angry all the time. He was better than Eric Bana, but … Apparently I am in the minority because Ruffalo has been signed to additional movies. Sadly, Edward Norton has gone the way of Val Kilmer: a great actor with a bad reputation for working well with others (rumor has it, that in Val’s case the directors probably should have listened to him more often but you know how that goes). In some ways it was like I was in school. It was not a book I would have chosen to read. But, thankfully, the Women’s Ministry wanted me to preview a book they want to use this summer. They wanted something that had chapters that were not dependent upon one another. People will be on vacation at times, so they wanted each lesson to stand on itself. But the author is not within our theological heritage. She’s a Christian, and we want to honor our theological heritage instead of giving people mixed theological messages. I may address this topic at a later date. They asked me to read To Fly Again: Surviving the Tailspins of Life by Gracia Burnham (with Dean Merrill). If you haven’t heard of Gracia, you’ve probably just forgotten that you did. She and her husband Martin were missionaries in the Philippines with New Tribes Mission. In 2001, they were kidnapped while enjoying an anniversary at a hotel. An Islamic militant group was rounding up foreigners to hold for ransom. This is called fund raising in certain corners of the world. They were held captive for over a year until there was one last gun battle with the army. This time Gracia was freed, while Martin was killed. She has a missionary foundation and a speaking ministry. I heard her speak at a fundraiser in 2010. She’s very engaging and has a great message. That comes across in this book. The chapters are short, and have the feel of more of a talk than an essay. That’s okay in my book. She weaves stories from her life that help make the point she presents with Scripture. The overarching theme is dealing with unexpected suffering. Life interrupts our plans, and sometimes in a way that strips us of our identity. We try all kinds of methods and mechanisms to try and control the uncontrollable. I could really identify with much of what she had said, particularly about identity. They “lost” their identity while being held captive. They were parents, but not parenting. Missionaries, but now captives. During the Great Transition of 2007-2010, I was a pastor but not. I earned my living doing pulpit supply, working in a hardware store and being an EKG tech at the hospital. My whole vocational identity was discombobulated. Down was up and up was down. Or was that sideways. Tough to tell in the tailspin, which is her point. Due to the topic, the book is fairly “atheological”. What I mean is that she doesn’t draw on the distinctive beliefs of any particular theological heritage within Christianity. The book is thoroughly Christian. Her view of sovereignty fits under both Calvinism and Arminianism (as far as it is expressed), but clearly not Open Theism. It is not a deep book, but it is an encouraging book. She helps us put our crashed and burned events back within the context of God’s love and care. Tragedy does not mean that God is weak or unloving. It means that He has greater purposes in mind than we do. We see this often in Scripture. I think of Joseph, Moses (the middle years) and particularly Jesus. For some reason we think it all stopped because of Jesus, not that Jesus gives it meaning. Paul and Peter had a more biblical perspective than we do. And Gracia is trying to point us in that direction- oh, so gently. My one criticism is that she calls union with Christ a metaphor. She’s not a theologian, I get that. She also lives in a time when we have greatly neglected the importance of union with Christ. It is a real thing, not a metaphor. If we are not united to Christ, we have nothing of Christ’s. In light of the overall context, this is not a huge deal. Just one of those things a guy like me notices. I’ve been going thru some smaller tailspins lately (more like minor setbacks), and I would find encouragement here. It also reminded me that I want to read In the Presence of My Enemies one of these days.